Is Your House Ready for a Roof Garden? Would you love to create a lovely flower garden or a practical patch of fresh, organic herbs and veggies? If you live in an urban home where outdoor space is limited – or even nonexistent – don’t let that put a damper on your dream. Rooftop gardening is the wave of the future. It’s green, it’s eco-friendly, and it makes excellent use of an unexpected part of your building. Here’s what you need to know to make your roof garden a sprouting success. Check your local laws. In some areas, planting a roof garden, even for personal use, might come with requirements such as pulling a building permit or the need to install guardrails. Make sure that your HOA or condo board approves, as well. Take into account the pitch, or slope, of your roof. Flat, low-slope, or combination styles are the most suitable sites for a trouble-free roof garden. Make sure that your roofing material is in good shape. You will find it much easier to take care of any necessary roof repair before you set up your vegetable patch or flowerbeds. Expect an asphalt shingle roof, the commonest type today, to last 20-30 years, typically; if your roof is approaching this landmark, you might want to postpone realizing your dream of a sky-high garden paradise. Have the roofing structure inspected by a qualified structural engineer or architect. The roof over your head will need the strength to safely support hundreds of additional pounds, comprising containers full of soil or other growing medium, which will become even heavier when they are watered. Don’t forget that the roof should be also be strong enough for you to walk on as you tend your garden. The good news is: if you live in a northern state, your roof is built to handle the weight of serious winter snowfalls. Purpose-build a new roof. If you are about to order a roof replacement, ask your contractor to make the new surface roof-garden-friendly, in terms of both structure and material. 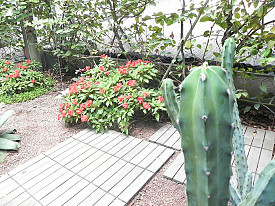 A little-known problem of roof gardens occurs when the strong heat of the summer sun softens a tar-and-gravel surface, for example, causing the plant containers to leave indentations. These make the roof more susceptible to leaks; however, your roofer can avoid problems by installing special rubber mats. For a garden atop any kind of roof, use an improved membrane to reduce the possibility of leakage. Consider any add-ons you might need. Constructing some stairs is a good idea, so that you will have easy access to the roof area. Unless you are growing exclusively low-water plants, you’ll want to install some kind of irrigation system. Fencing could be necessary to protect your crop of flowers or edibles against high winds and provide support for climbers like runner beans. Look into the possibility of free money (yay!) to help with the cost of a roof garden. Some cities or utility companies subsidize large-scale roof gardens, due to their positive impact on the environment. “Green roofs,” as they are nicknamed, act as an insulating layer to reduce heating and cooling costs. They also clean the air of carbon dioxide and pollutants. A fringe benefit is their soundproofing effect. Allow yourself to feel a little smug. A rooftop veggie garden will be safe from nibbling by pesky deer, rabbits, or groundhogs. You will still need to block squirrels’ climbing routes and keep away hungry birds, though. Get ready for fun. Gardening shouldn’t be all work and no play. Why not build a deck on the roof, where after a heavy weeding session you can relax with a frosty lemonade and enjoy the sight of your flourishing roof garden? Tree Care – DIY Or Call A Pro? We're In Love With Cool Container Gardens!